Large selection. Exceptional service. No pressure. 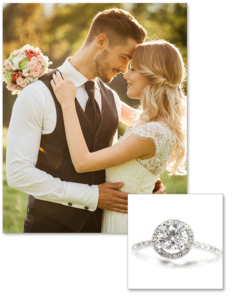 Don’t let the name fool you; the Estate Jewelers showroom includes a huge selection of stylish engagement rings and wedding rings at reasonable prices. In our jewelry showroom, you’ll find unique designs that no other jewelry store carries. Graded by our in-house GIA-trained diamond expert, you can assess and select the diamond that meets your expressed qualifications. Explore our diamond database by color, cut, clarity, shape, size and price. Our showroom can outfit you with an entire ensemble of jewelry if you desire: necklaces, earrings, watches, bracelets, and of course rings. Diamonds, fine gemstones, silver, and more compose our exquisite pieces. The wide selection of styles are categorized by price points as well, so you don’t have to worry about breaking the budget. Unlike other jewelry stores, Estate Jewelers has an in-house jewelry design team. 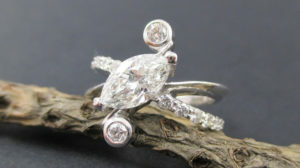 We can create a custom jewelry design for you based on your vision or a picture. Alternatively, you can select a one-of-a-kind custom designed jewelry piece that we crafted with care and have on display in our showroom. Each person is unique, and our selection provides a better opportunity for you to find the jewelry that affirms their beauty and personality. Behold one-of-a-kind pieces at a fraction of full retail prices – we carry everything from current styles to antiques. Our constantly revolving inventory is updated weekly. We want to help you make the impression you want to make, with less strain on the wallet. We offer 12 months same as cash financing.